Osteoarthritis is a condition involving the breakdown of the protective cartilage covering the ends of the bones, where two bones meet to form a joint. Osteoarthritis can also be known as degenerative or secondary arthritis, as the changes are more likely to occur when there has been previous injury. Knee osteoarthritis is the most common type of osteoarthritis. The knee joint is one of the large weight bearing joints and, while there is no direct genetic predisposition, your inherited anatomy, especially ‘bow-legged or knock kneed’ can lead to osteoarthritis. Continued mechanical stress, such as being overweight, will certainly make this condition worse. Any of the three main parts of the knee (the medial compartment, the lateral compartment, and the patello-femoral joint) can be affected by knee osteoarthritis. One or more parts of the knee may be affected at any one time, but the most common site for knee arthritis affecting a single compartment is in the medial (inner) compartment. Knee Osteoarthritis may arise when there has been no previous story of injury or damage to the knee. Sometimes it gradually comes on after an initial injury to the articular cartilage of the knee, and it is well known that having a torn cartilage increases the risk of developing knee osteoarthritis later in life. Early diagnosis and treatment help manage knee osteoarthritis symptoms. An overview of knee osteoarthritis will help you understand symptoms, diagnosis, and treatment options. Your surgeon will take a complete medical and physical history, and will usually arrange for x-rays of your knee which will show any degenerative changes to your knee joint. 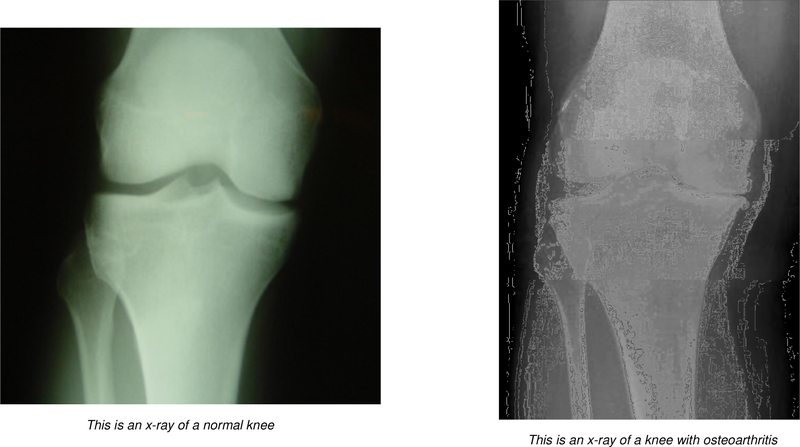 X-rays are very helpful, allowing the doctor to see evidence of joint space narrowing and rule out other causes of knee pain. If more detailed imaging is needed, an MRI may be ordered. 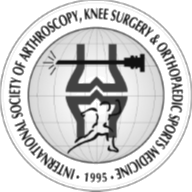 Arthroscopic knee surgery is another way to view the condition of the knee. As can be seen from these images, the cartilage is worn away and the space between the joint has narrowed. 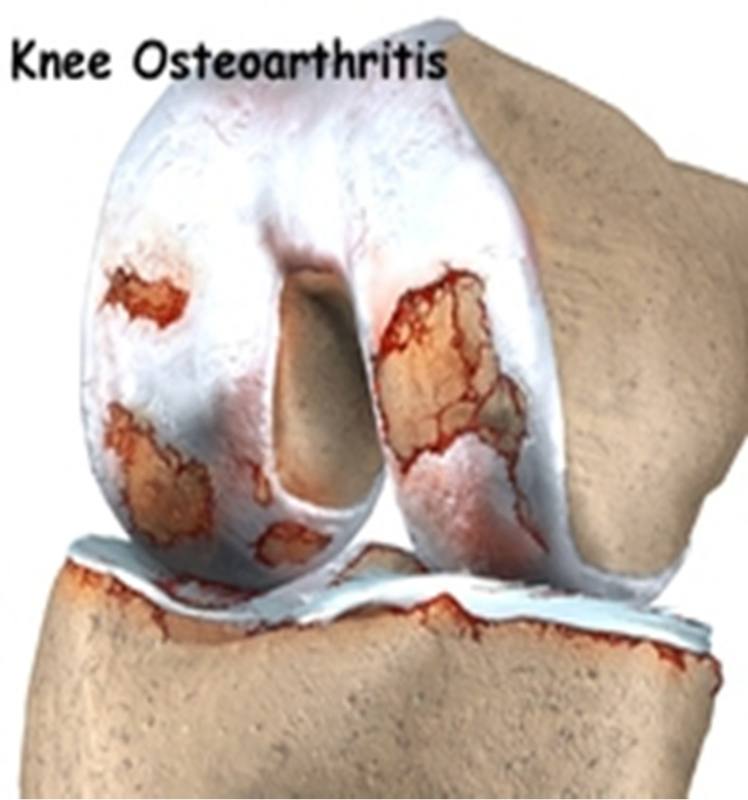 What are the typical symptoms of knee osteoarthritis? Knee osteoarthritis pain is usually worse following activity, especially overuse of the affected knee. Stiffness can worsen after sitting for prolonged periods of time. As knee osteoarthritis progresses, symptoms generally become more severe. Pain can become continuous rather than only when weight-bearing. Sometimes, because of the roughening of the knee joint surface, there may be catching, clicking, clunking or similar symptoms as well as pain. modification of activities and physiotherapy. A simple but effective analgaesic often needed 3-4 times a day. Cortisone injections into the knee joint can provide some relief from pain and inflammation, but this is not a long term solution. Often but not proven, some people gain relief from various naturopathic assistance, including magnets, acupuncture or glucosamine. There is some evidence to suggest that glucosamine and chondroitin sulfate can help maintain articular cartilage, however nothing can cause the cartilage to be ‘put back’. While exercise does not fundamentally change the arthritis in the knee, it has been shown to greatly assist with stability. Water based exercises are excellent as they offer support and allow the muscles of the legs to be strengthened. Also non-impact exercise helps to keep strength and tone in the thigh muscles. A simple elastic knee support may be beneficial in offering relief from the symptoms of osteoarthritis. There are also wedges or innersoles for footwear which can assist in the redistribution of weight throughout the knee joint. early, many people can effectively manage mild to moderate knee osteoarthritis. If the suspicion is of an early degree of knee arthritis and/or you are relatively young, it may be appropriate to have an arthroscopy of the knee. This will improve some of the mechanical symptoms arising from the knee, give some temporary relief by washing out the irritating debris within the knee, and define the exact problem with a view to later major surgery. However, knee arthroscopy treatment cannot reverse the damage or cure knee osteoarthritis itself. A high tibial osteotomy could be an option if the osteoarthritis and pain is caused by a misalignment of the knee joint such as being bow-legged or knock kneed. This type of surgery involves changing the alignment of the leg so that the weight load is transferred to the side of the knee that is not worn out. It is limited to people with arthritis in one half of the knee only. An osteotomy can provide functional relief for 5-10 years, at which time a knee replacement can be performed. Eventually the decision might be made between yourself and your surgeon, that the pain has reached the point where the only option is knee arthroplasty. Knee arthroplasty is a general term for knee replacement. Knee replacement may take the form of a total knee replacement or a partial (unicompartmental) knee replacement. The total knee replacement involves resurfacing the knee with a metal and plastic artificial joint. This has been shown to be excellent in relieving pain and stability within the knee. It does require several months of serious rehabilitation to achieve the desired outcome. The unicompartmental knee replaces the worn half of the knee joint with a prosthesis, however, it relies on the other half of the knee being in good condition. Statistically, half knees are likely to fail significantly earlier than total knee replacements but it is a smaller operation and the knee maintains a better bend. Treatment of knee osteoarthritis is usually a progression from simple non-surgical intervention to major surgical intervention. When the osteoarthritis is severe and causing progressive deformity, instability, severe pain or continued catching, surgery may be a realistic option.